John Lackey found a way to solve the problem of a lack of run support - throw six innings of no-hit baseball. 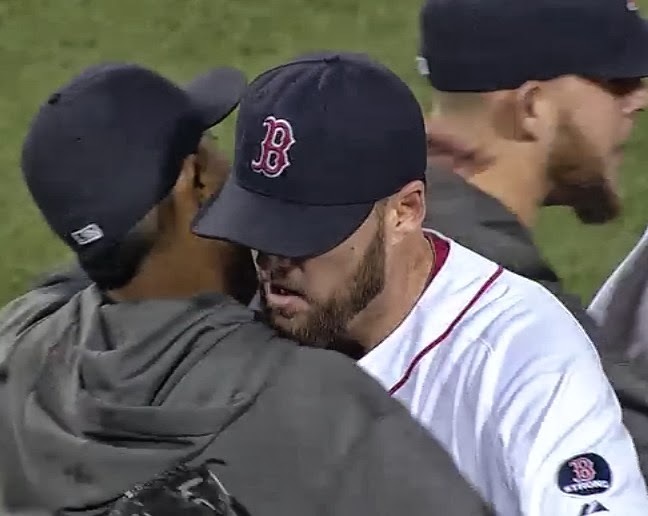 Lackey ended up allowing just one run on two hits as the Red Sox clinched a playoff spot for the first time since 2009 with a 3-1 win over the Orioles at Fenway Park. Boston scored three runs in the bottom of the second inning on Stephen Drew's thirteenth home run of the year, a two-run shot that scored Jarrod Saltalamacchia, and an RBI single by Dustin Pedroia. Lackey (pictured) kept the Orioles silent through six, until Adam Jones launched a rocket onto the roof of the garage across Landsdowne Street in left field. He ended up going all nine innings allowing just the one run on two hits; he walked a pair and struck out eight. Prior to Spring Training, teammates who had already seen John Lackey were telling anyone who would listen that the big righty was unrecognizable. Coming off arm surgery and to that point a Red Sox career with at best mixed reviews, Lackey showed up in Fort Myers visibly thinner and clearly healthy. His 10-12 record (his ERA dropped to 3.44 with tonight's game) is not an indication of how well he has pitched in 2013 and while he's not likely to be John Farrell's choice as the Game One starter in the playoffs, you can certainly understand why Red Sox fans no longer hold their collective breath when he's on the mound.